, a very industrious and useful writer of the seventeenth century, less known than his services deserved, and particularly entitled to notice in a work of this kind, was born Oct. 10, 1599, at Woolston, in the county of Warwick, of which place his father had been minister for upwards of forty years. Under his tuition he remained until he was thirteen years old, when he was sent to school under one Crauford, an eminent teacher at that time. Here he informs us that he fell into loose practices from keeping bud company, but occasionally felt the reluctance which a pious education usually leaves. At the end of four years he was sent to Cambridge, and entered of Emanuel, which was then, according to his account, the Puritan college. 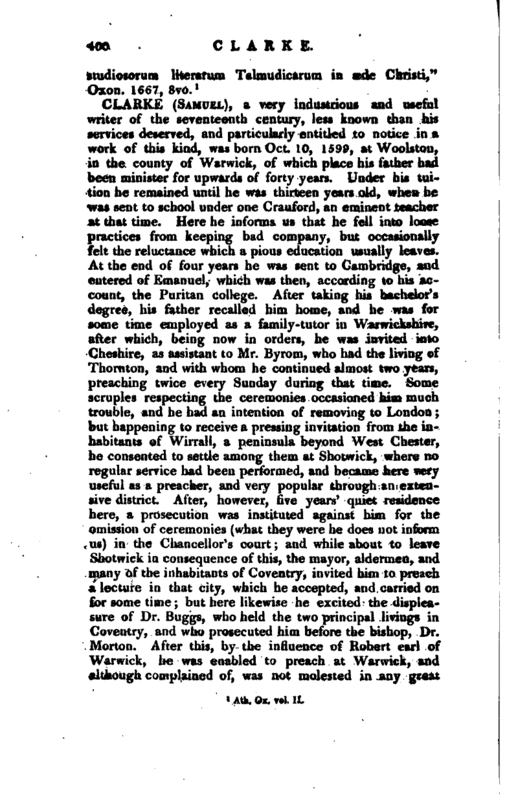 After taking his bachelor’s degree, his father recalled him home, and he was for some time employed as a family-tutor in Warwickshire, after which, being now in orders, he was invited into Cheshire, as assistant to Mr. Byrom, who had the living of Thornton, and with whom he continued almost two years, preaching twice every Sunday during that time. Some scruples respecting the ceremonies occasioned him much trouble, and. he had an intention of removing to London; but happening to receive a pressing invitation from the inhabitants of Wirrall, a peninsula beyond West Chester, he consented to settle among them at Shotwick, where no regular service had been performed, and became here very useful as a preacher, and very popular through an extensive district. After, however, five years’ quiet residence here, a prosecution was instituted against him for the omission of ceremonies (what they were he does not inform us) in the Chancellor’s court; and while about to leave Shotwick in consequence of this, the mayor, aldermen, and many of the inhabitants of Coventry, invited him to preach a lecture in that city, which he accepted, and carried on for some time; but here likewise he excited the displeasure of Dr. Buggs, who held the two principal livings in Coventry, and who prosecuted him before the bishop, Dr. Morton. After this, by the influence of Robert earl of Warwick, he was enabled to preach at Warwick, and although complained of, was not molested in any great | degree. Soon after, lord Brook presented him to the rectory of Alcester, where he officiated for nine years, and, as he informs us, “the town, which before was called * drunken Alcester,‘ was now exemplary and eminent for religion.” When the et c<etcra oath was enjoined, the clergy of the diocese met and drew up a petition against it, which Mr. Clarke and Mr. Arthur Salway presented to his majesty at York, who returned for answer, that they should not be molested for refusing the oath, until the consideration of their petition in parliament. This business afterwards requiring Mr. Clarke to go to London, he was chosen preacher of the parish of St. Bennet Fink, a curacy which is said to have been then, as it is now, in the gift of the canons of Windsor. Walker, from having included this among the livings sequestered by the parliamentary reformers, would seem to intimate that Mr. Clarke must have succeeded to it at the expence of the incumfyent; but the fact is, there was no incumbent at the time. We learn from Clarke’s dedication of his “Mirror” to Philip Holman, esq. of Warkworth in. Northamptonshire, a native of St. Bennet Fink, and a great benefactor to it, that for many years before this time (probably before 1646) the parish had little maintenance for a minister; theif tithes, being impropriated, went another way. They had no stock, no land, no house for the minister, no lecture, nor any one gift sermon in the year. This Mr. Holman, however, had furnished a house for the curate and settled it upon feoffees in trust, and had promised to add something towards his further maintenance. 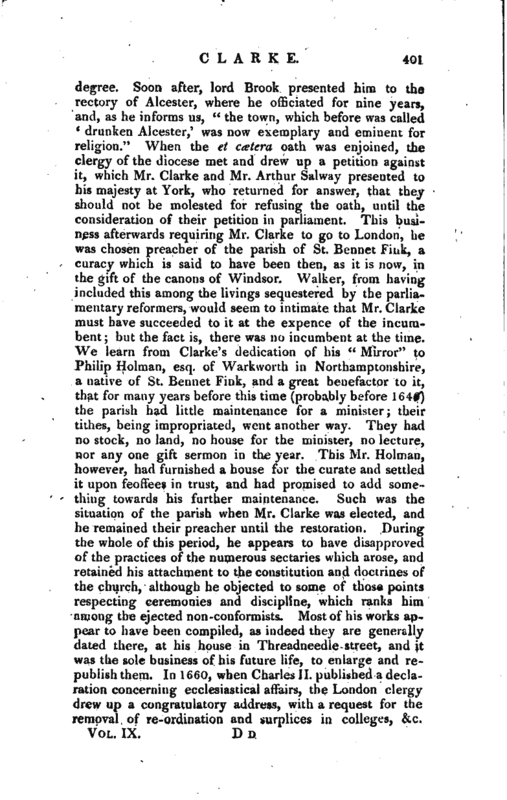 Such was the situation of the parish when Mr. Clarke was elected, and he remained their preacher until the restoration. During the whole of this period, he appears to have disapproved of the practices of the numerous sectaries which arose, and retained his attachment to the constitution and doctrines of the church, although he objected to some of those points respecting ceremonies and discipline, which ranks him among the ejected non-conformists. Most of his works appear to have been compiled, as indeed they are generally dated there, at his house in Threadneedle- street, and it was the sole business of his future life, to enlarge and republish them. In 1660, when Charles II. 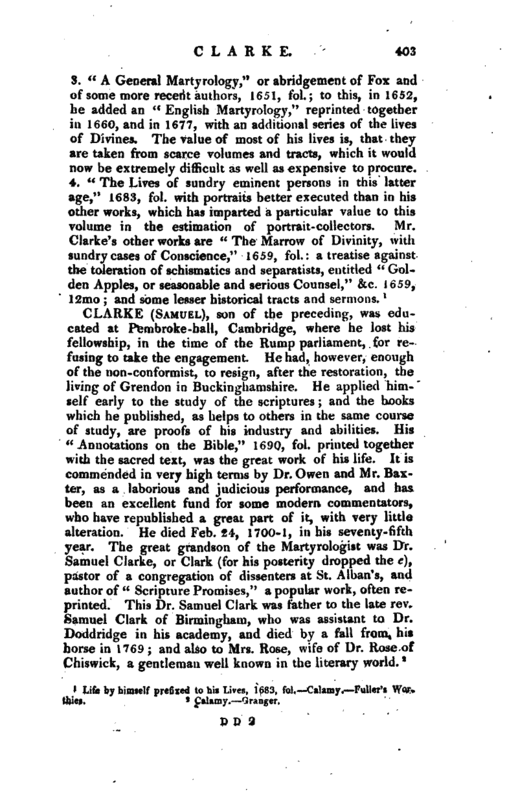 published a declaration concerning ecclesiastical affairs, the London clergy drew up a congratulatory address, with a request for the removal of re-ordination and surplices in colleges, &,c, Vol. IX. D D | which Mr. Clarke was appointed to present. 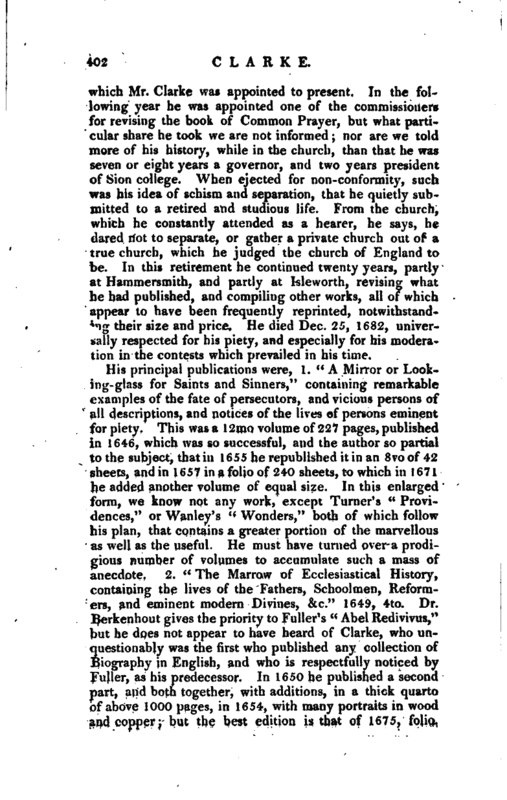 In the following year he was appointed one of the commissioners for revising the book of Common Prayer, but what particular share he took we are not informed; nor are we told more of his history, while in the church, than that he was seven or eight years a governor, and two years president of Sion college. When ejected for non-conformity, such was his idea of schism and separation, that he quietly submitted to a retired and studious life. From the church, which he constantly attended as a hearer, he says, he dared not to separate, or gather a private church out of a true church, which he judged the church of England to be. In this retirement he continued twenty years, partly at Hammersmith, and partly at Isleworth, revising what he had published, and compiling other works, all of which appear to have been frequently reprinted, notwithstand­*ig their size and price. He died Dec. 25, 1682, universally respected for his piety, and especially for his modera* tion in the contests which prevailed in his time. Life by himself prefixed to his Lives, 1683, fol. Calaiuy. Fuller’s Worthies.